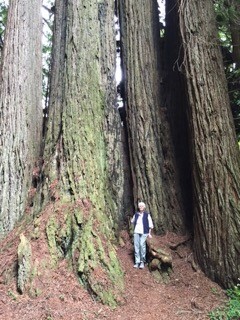 I recently returned from a wonderful trip to the Redwoods. Of course, the best part of the trip was spending a week with my daughter, Emily. Flying first class, courtesy of the PRA Holiday airline raffle, was wonderful as well. I could easily get used to traveling that way! Equally special to the time with Em was walking/hiking among these magnificent trees. I have a thing about trees, anyway, but being in the Redwoods is a truly transcendent experience. They are the tallest trees on earth and some of them are over 1,500 years old. As you may know, they are related to the giant Sequoias but only grow along a narrow coastal strip in Northern California. I promised myself to hold on to the awe and the stillness as I return home. All I need to do is look at the trees to bring it all back.